I am often asked about improvements in efficiency, return on investment (ROI), and other manufacturing-related questions about our PI process. These are questions your CPA or banker might ask of you. When we started doing PI, we didn’t bring in an accounting firm or focus group contractors, commission a study or any of those due diligence items that the local business school would expect us to do. No, we went with our gut. As a test, we set up a pair of saw horses in our shop and had at it. I grabbed a couple of my field installers, and we installed a panic device, door closer, and a kick plate while I observed. It took longer than normal for our field installers because they were not used to installing things on a horizontal plane rather than standing up vertically. Though they initially balked at the idea, I could immediately see the bigger picture. 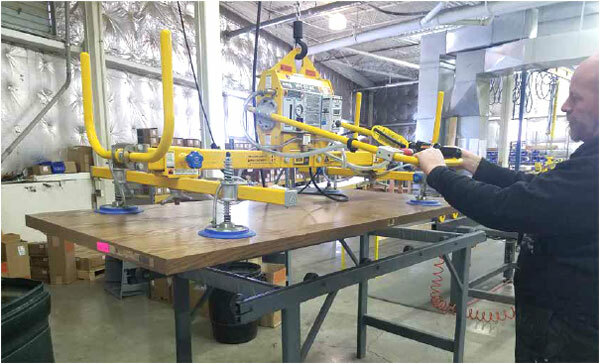 Less time in the field and more time in the shop would yield greater productivity. My gut told me that this was the way we needed to go. There are too many distractions in the field that make things cumbersome. In your shop, you can refine your process; you can make it lean. Everything we do is intended to take time and effort out of the assembly process. 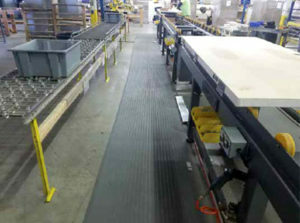 We cut down on footsteps by running a parallel roller conveyor line to our rolling PI work tables. 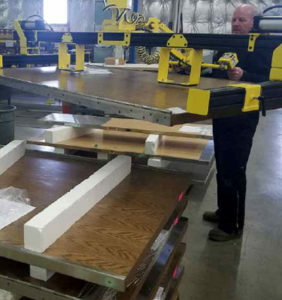 Doors roll down the production line from one roller table to the next while the hardware tub rolls down the parallel roller conveyor with it. This line carries the plastic tubs in which we place all the hardware for the specific door being dressed. Hopefully, by the end of the line, there are no hardware items left in the tubs. There should only be loose items like a wall stop, screws or weather strip. As you would find on an assembly line, our process will have more than one person attaching a different hardware item to the door. One installer does not follow the door down the line but stays on one table to attach, for example, the hinges and the flat goods before moving it down the line for the next installer to attach the closer, and finally, a table where the lock is attached. This allows for each of those installers to become an expert and efficient in the install of the various closers or locks that he will see the rest of the way as the entire project moves through the line. Your least senior installer would be at the hinge or flat goods table; your most senior installer should get the most difficult item. So from that first attempt at PI, we have now grown to PI being an integral part of the way we go to market. For us it is not a gimmick. Our top customers prefer receiving their projects with the hardware already attached. It works on so many levels for them, too. We become a much more important partner for them. We are not just a material supplier who ships them cardboard boxes of “stuff” that, in many cases, they are not qualified to install correctly. In the age of the internet, Amazon and BIM, I fear that anyone will ultimately be able to download a material list and beat you on a quote of “stuff.” We are not striving to be the low-cost provider. We do not want to fight based on price alone. Delivering fully dressed doors helps you become more valuable than just your delivery truck that pulls up on their project with boxes of materials. PI diffuses so many problems for the general contractor. You become a solution rather than a problem for them. As our organization became sold on making PI integral to our mission, it allowed us to grow from those saw horses into where we are today. From the beginning of our line to the pallet at the end of the line, there is no need for human lifting. Everything requiring a lift or a spin or a move to another area can be accomplished by the push of a button or a roll from table to table. I cannot tell you how many people we churned through as our door count climbed but our use of technology did not. New hires quit at lunch on their first day, “this is not for me.” You will wear out your installers if they must do all the lifting of fully dressed-out doors. It took several years before we committed to the nearly six-figure financial commitment to automate our production line. I wish I could tell you that once again we did a time study and a financial analysis of the cost benefits associated with a manual line versus a fully automated line. Again, I sell doorknobs. It was much less scientific than that. In fact, we initially believed that incorporating mechanical means to lift and flip doors might slow us down a bit. That happily has not been the case. Download the full article A Second Look at Pre-Installed Hardware to learn more about PI Space Commitment, Video Marketing Ideas, and more. Excerpt from the article, “A Second Look at Pre-Installed Hardware”, published in Doors + Hardware, 2017. Written by SCOTT T. WESLEY, Executive Vice President, Schiller Architectural Hardware. scott.wesley@schillerhardware.com.